Clubfoot or Talipes equino varus is a condition which leads to deformity of the foot in babies. This condition occurs in the womb and leads to feet to be turned inwards and downwards. This treatable condition affects approximately 150000 - 200000 births per year worldwide. This is one of the most common congenital deformities to occur at birth. It has been observed that fetuses develop with normal and the deformity can be detected in the womb at around 3 months. Most are born without any absences of bone, muscles or connective tissues. One or both feet can be affected and this condition is not painful but if neglected in a child who is walking, it may be painful and causes difficulties in walking. It is easily detected by observing the deformity at birth. The deformity can be flexible (easily correctable or stiff and rigid). The condition is detectable at birth. The foot are turned inward and downwards (refer to picture above). Before the child is born, the condition can be appreciated during ultrasound scans performed by the Obstetrician. If you are wondering if your child has clubfoot, please contact your Physician or Foot and Ankle Surgeon who has experience in diagnosing this condition. It is still unknown why clubfeet occur. Many have postulated it to be cause of a tight womb leading to a packing disorder of the fetus. It is inherited. The likely hood of a sibling to develop the condition if very high. Clubfeet has been treated by either serial casting or surgery. Dr Ignacio Ponseti has developed a method of treating clubfeet by serial casting and bracing. This method is currently the gold standard for the treatment of clubfeet. It involves serial casting above the knees, gentle manipulation and a special protocol. It has been shown to be able to treat clubfeet in 95 per cent of cases. Treatment is usually started immediately after birth. 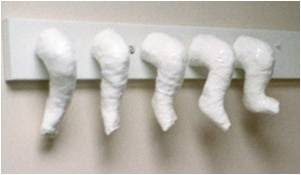 Clubfoot in older childer and in those with failed surgery can also be treated by Ponseti method. This method is used widely in developing countries where children present later with this condition. I was introduced with this blog by my guest. Thanks for promoting Ponseti Method. Hope we can work with you closely. We are going to bangkok this saturday to meet Dr Amnuay, certified Ponseti method for our daughter's clubfoot follow up. i'm interested to know more detail on this clubfoot treatment. my son has this congenital problem and surgery was done when he was 1 yr plus. currently he is 7 years old and another surgery was adviced. i would like to know is there is any other treatment besides surgery such as laser treatment. i would like to consult and get your opinion.. I'm interested to know more about this treatment to treat my right foot which has this since I was born way back in the 60's. Can it be treated and how much does it cost to treat this deformities ? Plse reply via my e-mail at buck2611@gmail.com asap and plse leave behind your contact number.